Lengthy delays at Durban Harbour almost certainly contribute to driver fatigue and accidents. As a follow on to my last story about the delays at Durban Harbour and the Agri Port, I arrived yesterday afternoon (July 6th) at 15h30 and followed the line slowly during the night. It is now 06h20 and I am number seven in the line. This is rubbish. I don’t know how the big bosses with their expensive shiny cars who work in the harbour can think that if it’s tea time everything has to stand still. The same happens at lunch time and with shift changes. It’s about two to three hours of work that is lost. Last week, it took three hours just to weigh my truck out after offloading. The bad thing is when I have offloaded, it will take me about six hours to get loaded again and I then stand for another 18 hours to offload again. According to the most of the drivers I have spoken to during the night, this is what is causing truck accidents on our roads. Everybody is tired and will now be speeding back to get loaded before 17h00 this afternoon. I myself am guilty of this. You push yourself to the max and reach speeds of up to 125kph with a truck. Hectic hey? Just think about this. You drive six to ten hours for which you get paid. You then stand in a line for 10 to 18 hours for which you do not get paid. It’s bad! I’m signing off now but I wanted to share this frustration with you. The sun is up and nothing has happened since 05h00. It’s now 06h53. Two hours lost due to a shift change. I can boil eggs in my #@#$$ at this stage. 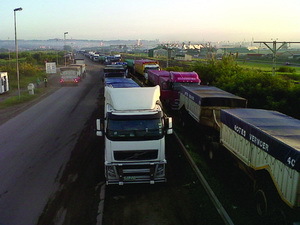 FleetWatch has stated on many occasions in the past that Durban Harbour is a major cause of truck accidents due to the delays imposed on truck drivers causing driver fatigue. This is not something new. What is new is that it has got worse over the years as our driver correspondent confirms. I take you back to an article I wrote in September 2000 headed ‘˜The Woes of a Transporter’ in which I interviewed Peter Burkhalter, then CEO of International Delivery Company (IDC) and a legend in the industry. Talking about lousy service, he highlighted Durban harbour where, he said, the service standards and efficiencies had dropped to an all-time low. “We have to set times with our customers to load but we cannot do this anymore because we don’t know when we’ll be offloaded at the harbour. Just today one of my trucks arrived at the harbour at 9.00am and was told to wait until 2.00pm when a machine would be available. And it has been worse. One of my trucks arrived at 11.00am, off-loading began at 10.00pm and it only finished at 12.00am.’ Compare that to the times drivers now have to wait , up to two days , as confirmed by our driver correspondent. That interview was carried in the September 2000 edition of FleetWatch. Compare Burkhalter’s words spoken in 2000 with those of our driver correspondent written in 2011. What has changed over the past 11 years? Nothing. No, I’m wrong. Something has changed. It’s got worse. Durban harbour needs to catch a big wake up and take into account the absolute chaos it is causing in the trucking industry and to the supply chains of this country. FleetWatch invites our truck drivers out there to share their stories with us – please e-mail fleetwatch@pixie.co.za and make your voices heard!